Trying to pick out a first time bike for your child can be a tedious experience. There are plenty of choices you can go with not to mention all the things you need to take into consideration like the safety features, the weight, and the design. 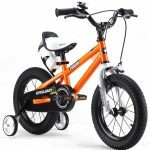 Since it is going to be your child’s first bike, you want something that will make them grow to love cycling and not one that’ll ruin the experience for them. If you’re looking for such a bike, then perhaps what you need to check out is the royal baby 14” MG DINO kids bike. 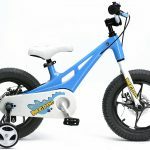 First of all, the royal baby 14” MG DINO kids bike was designed with a very light magnesium frame – for comfort, safety, and good anti-impact performance – as well as a sturdy front fork made from steel. This makes for a perfect blend of strength and lightness. Secondly, the rims are one piece rims, also made from magnesium, with a 16x2.4” knobbly wide tires. The tires are designed to make navigating the bike in all roads and across all terrains whether it is muddy, or filled with grass, very easy. Thirdly, the features of the drivetrain consist of a durable, a sole speed system, a single piece crankset, as well as a ball-bearing bottom bracket. The single speed system helps in making this bike so lightweight, more resilient for riding off the road and on flat ground and also provides greater efficiency. The one piece crankset ensures that your bicycle will require very little maintenance so your kid can enjoy themselves for years to come without you having to worry about constantly fixing it. The royal baby 14” MG DINO kids with its magnesium alloy frame give your child the safety and comfort they require on a first kid’s bike. The bike also comes with an excellent anti-impact performance and a structure that has been specially designed to inspire confidence in young riders while also reducing the risk of them tumbling from the sides. A curved surface and smooth lines make this a beautiful bike that’ll soon be a favorite of your child. The 14” frame was constructed for kids between the age of 3-6 to be fun and durable at the same time. In addition, the size is made just right, so it’s comfortable for a three-year-old and a six-year-old. The design is fun to look at, the features are splendid, and it gives a great overall user experience. Your child can’t help but fall in love with it. It comes in only one size. The 14” and has been specially designed to give 3 to 6-year-olds an enjoyable riding experience. If you would prefer a different size then why not check out the other royal baby bike models. 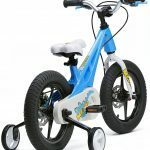 The bike has been specially designed to be lightweight to make it easy for your child to use. The total shipping weight is 14kg, but the weight of the bike alone is 9kg. Yes. The product comes with in a box with all the parts and assembly tools you’ll need. It also comes with an easy to follow manual so you can have the royal baby 14” MG DINO kids bike. up and running in no time. Is royal baby 14” MG DINO kids bike.extremely heavy? MG DINO bike was created with super light magnesium alloy and a hollow frame that helps reduce the weight of the bike considerably. Your little one should have no problems moving this bike around. 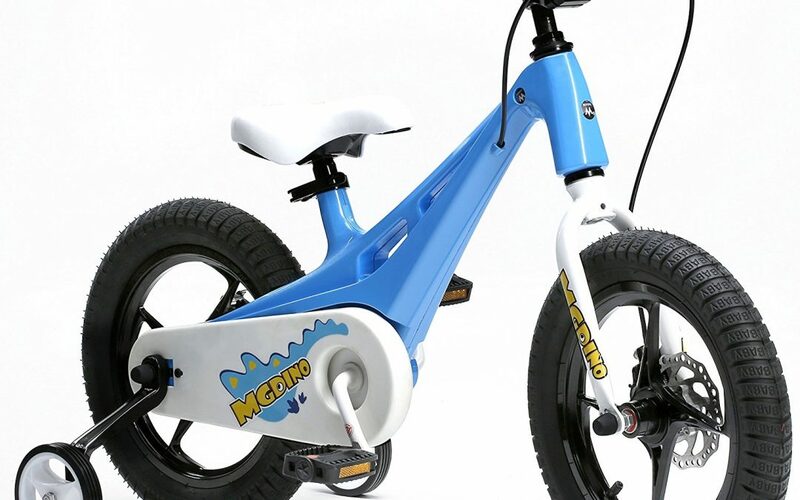 Is the royal baby 14” MG DINO kids bike. durable? Safe and secure and can last for years without having to worry about having to replace it regularly. Unless the circumstances were accentuating, like the neighbors accidentally running over it, you should have no problems with it. That both tires are properly inflated, and there’s no leak. To make sure that all the parts are in excellent working condition. That every bolt, screw, and nut are all tightened correctly. This is a beautiful and lightweight bike making it easy for your child to maneuverer. It is perfect for both girls and boys making it an excellent gift for your child.